Louise de Marillac was born probably at Ferrieres-en-Brie near Meux, France, on August 12, 1591. She was educated by the Dominican nuns at Poissy. She desired to become a nun but on the advice of her confessor, she married Antony LeGras, an official in the Queen's service, in 1613. After Antony's death in 1625, she met St. Vincent de Paul, who became her spiritual adviser. She devoted the rest of her life to working with him. She helped direct his Ladies of Charity in their work of caring for the sick, the poor, and the neglected. In 1633 she set up a training center, of which she was Directress in her own home, for candidates seeking to help in her work. 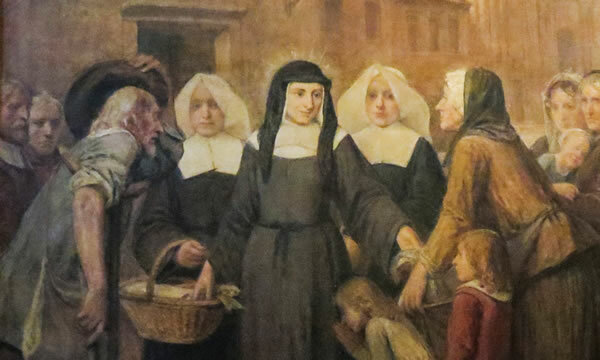 This was the beginning of the Sisters (or Daughters, as Vincent preferred) of Charity of St. Vincent de Paul (though it was not formally approved until 1655). She took her vows in 1634 and attracted great numbers of candidates. She wrote a rule for the community, and in 1642, Vincent allowed four of the members to take vows. Formal approval placed the community under Vincent and his Congregation of the Missions, with Louise as Superior. She traveled all over France establishing her Sisters in hospitals, orphanages, and other institutions. By the time of her death in Paris on March 15, the Congregation had more than forty houses in France. Since then they have spread all over the world. She was canonized by Pope Pius XI in 1934, and was declared Patroness of Social Workers by Pope John XXIII in 1960. Her feast day is March 15th.